​Welcome to Soaring Hawk Elementary! Established in 2004, Soaring Hawk Elementary School (SHE) offers a high quality, student-centered kindergarten through sixth grade education. Our curriculum builds rigorous, equitable and inclusive learning options for all students. The Soaring Hawk staff has very high expectations of our students and creates opportunities for students to explore new concepts in a variety of ways. The SHE Habits of Character provide opportunities for students to show integrity and compassion while being resilient explorers, active learners and contributing citizens. The Soaring Hawk community truly cares about the whole child, addressing the strengths and passions that deserve equal attention in the development of all students. We are happy to start another school year partnering with Red Apple Recycling, a Denver-based 501(c)(3) non-profit. You donate clothing and other small household items, Red Apple Recycling recycles them and our school earns money! To date, this nonprofit has raised over $80,000 to continue valued efforts like recycling, composting, creating gardens and wellness programs. This collaborative piece was created using encaustic methods (melted beeswax with pigment added). We created a series of these pieces, with each student at SHE producing a portion of the mural. 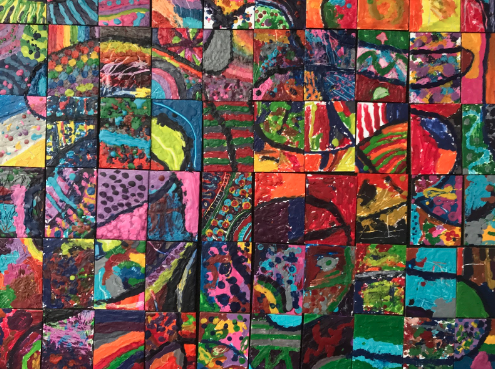 Students also helped to grid the piece, and create a continuous line throughout, to symbolize our interconnectedness as a school community. Proof of Residence (Warranty Deed, Deed of Trust, Property Tax Notice, Lease Agreement, County Assessor Page or Notarized Proof of Residency letter from the person you are living with (if your name doesn't appear on the proof of residency) along with a copy of their proof of residency. If you live outside our attendance boundary you will need to fill out the Open Enrollment application before submitting the registration forms.